with Karim Malhas, Thomas Garcia, Joris Barcaroli artistic collaboration Élise Ouvrier-Buffet production Cie Gorgomar co-production Théâtre de Grasse, L’Entre-Pont, La Fabrique Mimont - Cannes, Festival Scène de Cirque - Puget-Théniers help with production from the Conseil Régional PACA with the support of the Ville de Nice and the Conseil Départemental des Alpes-Maritimes. Today is the big day. 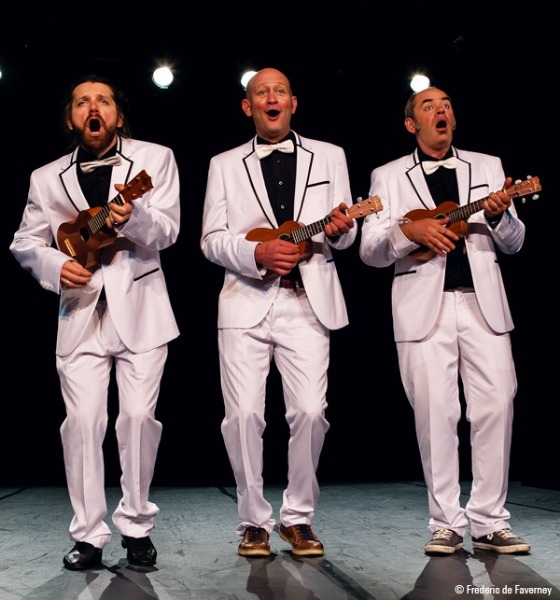 Three ukulele-loving clowns are giving their first concert in Hawaii but it’s a disaster: they are far too clumsy, the music stands are too fragile, the soloist too rigid, there’s sand everywhere… The whole thing is a fiasco, and no one knows what to do! Thomas Garcia directs a group of oversized children who play the whole range of ukuleles from Papa baritone to Sister soprano. Their surprising repertoire ranges from Britney Spears to Bach, hard rock to original love songs written by the happy troupe. A delicate and humorous homage to the films of Chaplin, Tati and the incomparable Marx Brothers! An orchestra unlike any other where the ukulele turns out to be a clown’s best friend!